Lying just twelve miles from Tara, the ancient ritual site of Tlachtga was the centre of Celtic religious worship, over two thousand years ago. It has been overshadowed by its famous neighbour, and has not received the attention it merits as a place of importance in its own right. This was the centre of the Great Fire Festival that signalled the onset of winter. The rituals and ceremonies carried out here by the pre-Christian Irish, offered assurances to the people that the powers of darkness would be overcome, and the powers of light and life would, once again, be in the ascendancy. This was the place where the Celtic sungod was celebrated at the year's end. Many of the traditions, which originated at Tlachtga, have come down to us today in disguised, but recognisable form. No understanding of the ritual and political significance of Tara can be gained without an appreciation of the importance of Tlachtga in the religious life of the pre-Christian Irish. Published by Pikefield Publications, 9 Hazelwood Court, Glanmire, Co. Cork in October 2000, Google Books Listing. This book is the culmination of four years research of the history, archaeology and mythology associated with Tlachtga. Unfortunately, Tlachtga has been neglected, both from a physical and academic point of view. A flicker of interest was shown in the site in the last years of the nineteenth century, when Eugene O'Growney, cleric and professor of Irish at Maynooth College published a paper about Tlachtga. However, his untimely death in 1899, saw this interest eclipsed and Tlachtga again faded from the public stage. It has suffered considerably from being overshadowed by its famous neighbour, Tara, which lies just twelve miles away. I have been working I closely with the Athboy Heritage Forum, over the past number of years, in an attempt to highlight Tlachtga as a place of importance in its own right. Hopefully, this book will go some way towards achieving this objective. The sources available are widely scattered and indeed quite limited, but I think that I have been successful in painting a coherent and fairly clear picture of the place. The main aim of this book is to stimulate a bit of debate, which may ultimately result in an archaeological examination of the site. While literary, historical and mythological sources play a vital role in our understanding of Celtic Ireland, it is unlikely that the complete picture of the place will emerge without the aid of the archaeologist's trowel. Scattered across the rich Meath countryside, there is evidence of extensive human activity dating from earliest times. The oldest monuments in the area are to be found at the magnificent passage tomb cemetery at the Bend of the Boyne, near Slane, in north-east Meath. Standing on a ridge on the north bank of the river, the passage tombs are estimated to date from 3200BC. There are more than forty monuments on the site, the best known of which are Newgrange, Knowth and Dowth. The passage graves consist of a burial chamber, constructed from large upright stones and accessed through a passage to the interior. The chamber and passage are completely covered over by a mound of loose stones and turves, which are held in place by a kerb of massive slabs laid along their edges. The complete area enclosed by the Newgrange tomb is about a hectare. In 1963, during an archaeological examination of the site, a fascinating feature was discovered, which left archaeologists in no doubt about the sophistication of the people who built it. Although the site had been discovered in 1699 and had attracted much speculation, it was at that time thought to be solely a burial chamber. What Professor O'Kelly discovered cast doubt on previous theories and opened up a whole new vista of speculation. Situated above the entrance, he found a one metre wide opening which allows the rays of the rising sun to penetrate into the chamber at the time of the Winter Solstice. Much significance has been attached to this feature and a wide range of theories have been put forward to explain it. There is no doubt that it was used as a place of burial, as the cremated remains of several persons were discovered in the chamber. However, in light of this discovery, it is doubtful if its primary function was that of a grave. We may draw parallels with the cathedrals of our own age. Inside, and perhaps under, most cathedrals we will find the buried remains of bishops and other senior clerics, but no one would suggest that the primary function of the cathedral is a place of burial. Instead, the grandeur of the cathedral is an expression of the beliefs of the society that built them. In a similar way, Newgrange may be seen as a mausoleum for the dead and a temple for the living. O'Kelly suggests that the archaeological finds at Newgrange do not contradict the idea that Newgrange acted as a house of the dead as well as an abode to the gods worshipped by its builders. The annual visitation of the sun, at the Winter Solstice, to the gods who dwelt at Newgrange may indicate that the site was primarily the home of the sungod and that burials were a secondary consideration. The tomb must have been a source of awe and wonder from earliest times and the arousal of such emotions may have played no small part in the minds of the builders. Perhaps the tomb was built as much to commemorate and arouse respect for the gods as to provide resting places for the newly dead. Another theory put forward is that the chamber acted as an elaborate calendar. O'Brien points out that, at the Winter Solstice, the sun has reached its most southerly rising position on the eastern horizon before it changes direction. This movement cannot be detected by the naked eye. The moment of change in the suns direction marks the shortest day of the year and as the sun moves north along the eastern horizon, the days begin to grow longer. This brings with it the promise of Spring. The central chamber at Newgrange provides a perfect environment to plot the movement of the sun. Shortly after sunrise on this day, the first beams can be detected on the ground of the chamber. As the sun rises, the beam lengthens to over three metres, until it reaches the back of the chamber. When the beam is at its longest, it represents the most southern position of the sun. The beam then shortens as the sun retreats on the horizon, once again leaving the chamber in total darkness. This is a momentous time in the lives of a people to whom the changing of the seasons was a matter of life and death. The detection of a change in the movement, eagerly awaited by sun observers and recognised, would offer assurance that the forces of light are once again in the ascendancy and the cycle of life would continue for another year. Five thousand years of time has cloaked the original intentions of the builders in mystery, but it seems certain that the great mound is much more than a burial chamber. If we move forty kilometres to the west, we will come to the passage grave cemetery at Loughcrew. On the summit of a range of hills known as Slieve na Callaigh (the Hill of the Hags) is an impressive array of monuments which are closely associated with the builders of the Newgrange complex. It is thought that the passage graves at Loughcrew were built by the same people who built Newgrange, although it seems likely that eight hundred years in time separate them. De Valera is of the opinion that the Newgrange and Loughcrew systems were built by a wave of invaders who landed near the Boyne Estuary, and over the course of the next millennium travelled west, finally constructing the Knocknarea complex in County Sligo. These invaders were thought to have come from Brittany, across the Irish Sea, and represent the movement of Neolithic (New Stone Age) peoples spreading westwards across Europe in the forth millennium BC. It has been noted at one passage grave at Loughcrew, known as Cairn T, that the backstone of the chamber is decorated with abstract motifs showing some similarity to the decorations found at Newgrange. O'Brien has demonstrated that this pattern of motifs is closely associated with the movement of the sun about the time of the Spring and Autumn Equinoxes. He suggests that the daily change in the pattern of the sun beam was great enough to identify separate days, as represented by the pattern on the stone. There seems little doubt that this astronomical alignment was the intention of the builders and indicated the presence of a technically advanced culture at the site. The amount of labour expended in raising the mound over the grave indicates that Cairn T held a strong ritual significance for the builders. Here, as at Newgrange, the link between the sun penetrating a complex structure at significant dates and the use of the sites as places for burial, demonstrates clearly that these sites were important places in the sacred calendar of the early settlers. It is impossible to determine the detail of the ceremonies which occurred, but it is evident that the fate of the dead was closely bound up with the cycles of the sun. This suggests a strong belief in the concept of an after-life where the sungod held an exalted position. Moving our focus south of the River Boyne from Newgrange, we reach the most famous site of all. Fifteen kilometres away on the crest of a low hill, stands the royal site of Tara. It lies mid-way between the towns of Navan and Dunshaughlin in gentle rolling countryside. The hill rises one hundred and fifty-five metres above sea-level and commands dramatic views of the Meath Plain to the south and west. This aspect was probably an important factor in the choice of the hill as a ritual and political focus. Tara is the primary ritual site in Ireland (and the best known) and has gathered to itself a corpus of mythology and legend unparalleled in Irish literature. It was the home of highkings and heroes from time immemorial and has attained a place in Irish consciousness which embodies the entire concept of being Irish. Tara has been the scene of intense archaeological study in recent years, under the Discovery Programme and while much work remains to carried out, the archaeological evidence produced so far does not contradict the rich associations of traditional thought. The greatest concentration of monuments is on the summit, with over thirty monuments visible. The oldest is the so called "Mound of the Hostages" and is, in fact, a passage tomb built around 3000BC. Some forty burials, dating from the Bronze Age, were found in the clay covering the cairn, but the sole burial found inside the mound was that of a teenage boy. That this youth was of privileged rank can be deduced from the rich variety of grave goods found in the grave. This burial represents the earliest evidence of occupation in the area and the history of the site can be traced in an unbroken line to the modern times. Other monuments visible on the Hill include Rath Laoghaire, where it is said that Laoghaire, the Highking, famous for his clash with St Patrick, is buried. Rath na Rig - the Fort of the Kings, is a large oval structure, enclosing a number of other undetermined monuments and may date from the Iron Age. The Forrad and Tech Cormac are two co-joined earthworks. The latter traditionally believed to have been the home of the famous king Cormac MacArt, while the Forrad shows at least three phases of development which Newman suggests may have been a deliberate attempt to associate an earlier burial complex with a later habitation site. The Rath of the Synods lies close to the wall of the modern church and was named to commemorate an ecclesiastical synod held here by the Abbot of Iona. While large parts of the structure were destroyed, by a group known as British Israelites, in 1899, in a misguided attempt to locate the Ark of the Covenant here, this is the most important monument on the hill from our point of view. The Banqueting Hall consists of a linear earthwork of two parallel banks. Medieval writers have seen this as the remains of an elaborate hall of the king's court, but is now thought to be a monument known as a cercus. This type of monument is sometimes described as a ceremonial avenue, often aligned with ritual or burial sites. Though rare in Ireland, two possible examples exist at Loughcrew and Newgrange. Rath Grainne and the Sloping Trenches complete the picture of the best known monuments on the Hill. Both are believed to be barrow burials. The central place accorded to Tara in Irish literature proclaims the importance of the place, and indeed the epithet by which the modern County of Meath is known - Royal - comes from the association of Tara with the mythological and historical kings o Ireland. It is said that the greatness of Tara declined in the seventh century, following a curse of a Christian Saint on the place, but it still holds a symbolic place in the mind of the people up to the present day. The Insurgents of 1798 gathered on the hill an Daniel O'Connell M.P. shrewdly, chose it as the site of the biggest assembly ever see in the country. We can travel fifteen kilometres north west of Tara, crossing the Rivers Boyne an Blackwater, until we reach the important site of Tailteann. Known today as Teltown midway between Navan and Kells, this is the site of the great Harvest Festival of Lughnasa. 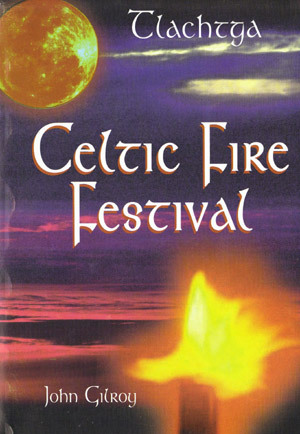 This festival is dedicated to the god Lugh, who was one of the most important gods in the Celtic pantheon. Today the site is unimpressive. There are number of earthworks spread over a wide area, but Harbison tells us that the most probable centre of ritual activity was Rath Dubh - the Black Fort. A long mound on the other side of the main road, known as the Crockans, is associated with the "Teltown Marriages'' where young people held hands through a hole in a wooden door, lived together for a year and a day, and after that could separate if they so wished. The festival of Tailteann survived in one form or another until the latter years of the eighteenth century, when it was discontinued having incurred the displeasure of the local clergy. A brief discussion of the important site of Uisneach will complete the picture of Celtic Meath. While not situated within the boundaries of the modern County of Meath, Uisneach was considered the centre of the island of Ireland in what was once the fifth province of the country. Uisneach is situated twelve miles west of Mullingar in County Westmeath. There are several earthworks on the hill which include burial monuments and a fort. This site is closely connected to the Festival of Beltainne - the First of May. It was an important assembly point in pre-Christian Ireland, and the Summer Fires were lighted here. Cattle driven through the fires were protected from evil influences for the coming year. The importance of the place is suggested by the fact that it is recorded that the great god Lugh was killed here. We are also told that the second century king, Tuathal Techtmar, established one of his royal fortresses here. We have barely scratched the surface of Meath's Celtic landscape in the previous pages by outlining the main sites in the county. No useful study of Tlachtga would be possible without reference to the sites in the wider county and we will have reason to return to the topics of this chapter many times in the following pages. The major ceremony held at Tlachtga was the lighting of the winter fires at Samhain. These celebrations are now continued by local man Joe Conlon on the 31st of October.